What Can’t I Put In My Prenup? 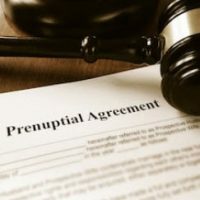 Prenuptial agreements are more commonplace than ever, especially among people who are more prone to marry later, with more assets. They are a smart way to safeguard property so that future division, either in probate or divorce, does not necessarily need to involve decisions by a court. However, many couples are unaware that there are certain things that cannot be put in a prenup under Nevada law. It is a good idea to research potential problems before going ahead with your agreement. While couples have quite a lot of leeway in terms of disposing of assets in a prenup, they must adhere to the standard rules of contracts while doing so. A prenup must be in writing, it must be signed by both parties. It does not need additional consideration in order to be enforceable (consideration is required for most contracts). However, prenuptial agreements must also adhere to the rules of what contracts cannot do, as well as additional specific restrictions. Generally, contracts are considered unenforceable, or at the very least open to review, if there is any evidence of fraud, duress, or unconscionability. This is codified in the relevant Nevada law, wherein it states explicitly that a prenup is unconscionable if any of these things occur. It can sometimes be difficult to identify when something is unconscionable, but if arrangements shock the conscience of a reasonable person, there is a good chance they are unconscionable and unenforceable. Another major issue when crafting a prenup is in dealing with child custody and support. Parents do have a duty of support for their children. However, support is a right that belongs to that child, not to the parents, and as such, it cannot be negotiated away by parents. If you and your spouse try to execute a postnuptial agreement to deal with the issue of child support, the courts will generally invalidate such provisions. The rationale is that negotiating child support without assessing the individual factors in any given situation, almost always runs contrary to the best interests of the child, and the best interests of the child are the watchword for Nevada courts. Prenuptial agreements are still a good option for many couples to ensure that they have a plan set up in the event of a divorce so that long court battles can be avoided. However, that plan has to be enforceable. If you have questions about your prenup, calling an experienced attorney is a must. The Kainen Law Group has years of experience in these types of cases, and we are happy to try and help you with yours. Call our Las Vegas offices today to schedule an appointment.